Mute swans throughout New York State have found a hero in David Karopkin, 30, a June graduate of Brooklyn Law School. In between cramming for exams this year, Karopkin spearheaded efforts to keep the Department of Environmental Conservation from eradicating the state’s entire mute swan population. Now he’s awaiting a decision from Gov. Andrew Cuomo. For the second year in a row, the New York state legislature passed a bill calling for a two-year moratorium on the DEC’s plan to eliminate some 2,200 mute swans. The legislature also calls for the DEC to provide scientific evidence that mute swans harm the surrounding environment. Last year, the governor vetoed the bill. The DEC and its partner — the USDA’s Wildlife Services – accuse the mute swan, brought here in the 1800s as an ornamental addition to private mansions, of being invasive, saying that it disrupts fragile habitats needed by other species. “There is no hard evidence that mute swans harm the environment,” says Karopkin, whose wildlife advocacy site, GooseWatch NYC, launched a petition asking New Yorkers and others to help protect the swans – whose presence usually evokes visions of peace and tranquility. “That’s also not how New Yorkers want their tax dollars spent,” he adds. The petition garnered so many signatures that the DEC took notice, scrapped its original plan and went back to the drawing board. Karopkin also worries that more than a thousand swans will still be killed if the bill is vetoed. He also points out that mute swans in New York City probably have a survival edge over those elsewhere in the state. “They’ll leave downstate swans alone because this is where wildlife officials got the most resistance,” he says. Officials also accuse the mute swan of being aggressive. 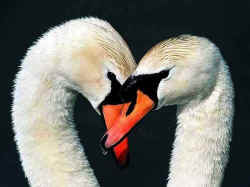 However, advocates and people who enjoy the swans also see them as harmonious creatures comfortable around humans. “Mute swans don’t generally exhibit aggressive behavior unless provoked or threatened,” says Karopkin, who recently began a 10-month grant as a legislative aide to the New York City Council. “I have a lot to learn about how our government works and the grant will help me get first-hand experience,” he adds. Swan cruelty has also come into play. New York State Sen. Tony Avella, one of the legislative backers in the fight to save the swans, expressed shock that the day the senate passed the two-year moratorium plan, wildlife officials shot two swan parents at a park in upstate New York, leaving four orphaned baby swans. The killings also took place in front of families enjoying a day at the park. Karopkin, who grew up in Brooklyn, formed GooseWatch after the feds rounded up geese from Brooklyn’s Prospect Park several years ago under the guise of air safety. Over the years, he has worked tirelessly orchestrating rallies and other events to keep the city’s Canada geese from being rounded up and gassed at parks within a 7-mile airport kill zone. New Yorkers, aware of Karopkin’s earnestness in educating the public about geese, encouraged him to take a leadership role in protecting the swans. Research also indicates that mute swans may be in trouble in other states. Michigan is also in the throes of widespread controversy; in Maryland, some 6,000 mute swans have been killed in the last few years, and in New Jersey, officials have killed mute swans (and like Canada geese), sometimes in secret. As a result, leading swan researchers and rehabilitators in three states — Florida, New Jersey and Michigan — agree that such unorthodox actions indicate that something is amiss; that there may be another reason officials advocate killing mute swans. “What wildlife officials really want is the habitat so that they can introduce a species more conducive to hunting,” says Sheila Bolin of the Regal Swan Foundation, and an international expert in swan behavior. Ironically, that species is another swan. The trumpeter swan, she says, is the designated “trophy” bird, the highly prized “game” bird that the feds hope will revive hunting, which has, for decades, been on the wane. There are also indications that the trumpeter swan – which has never been numerous south of Canada — is already being introduced by wildlife management agencies to new areas, paving the way for widespread hunting of North America’s largest waterfowl. However, the DEC draft indicates that the agency has not initiated any management to promote or control the trumpeter swan there. Meanwhile, Karopkin is hoping that New York State will be the model for other states fighting to save their mute swan populations. “I feel that what is happening with the swans is preventable and that we’re breaking new ground,” he adds. And if the governor vetoes the bill again?